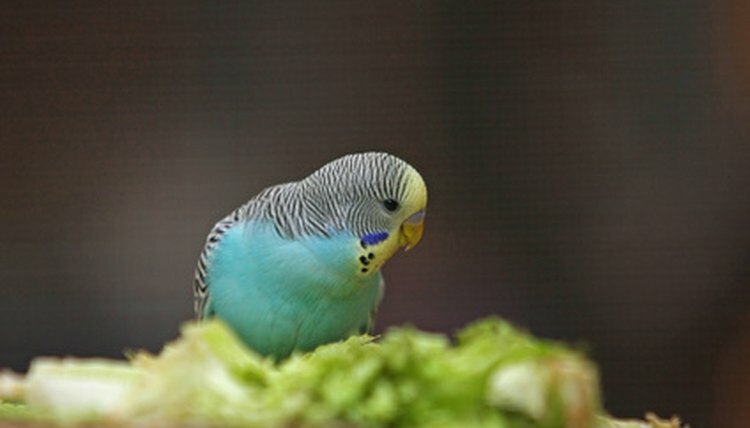 The name parakeet refers to any number of small birds with long, flat tails, but most references are to the budgerigar. Canaries are small, short-tailed birds that belong to the finch family. The parakeet has what is known as a hookbill, a beak that curves sharply downward. The canary has what is known as a softbill, in which both the top and bottom protrude straight out and come to a point. Parakeets have a small patch of skin above their beaks known as the cere. The color of the cere is a good indication of the bird's gender. Canaries do not have a cere. As a general rule, canaries are not the type of bird that can be trained or taken out of their cage to play. There are many breeders who hand-feed baby parakeets, leading to a social bird that is willing to be shoulder trained and interact outside of its cage. For the most part, a canary is one solid color, though it is occasionally two-toned. Parakeets generally have dark gray stripes near the head and dark blue or purple patches under the eyes in addition to the coloring of the rest of their feathers. It is not unusual for one parakeet to display five different colors. Canaries weigh an average of between 12 and 29 grams. Parakeets tend to be a bit heavier, usually 25 to 60 grams. Avian Web LLC; Budgerigar aka "Budgie"